Diaspora is a beautiful word that signifies both place and displacement, connection and disconnection, past and future. 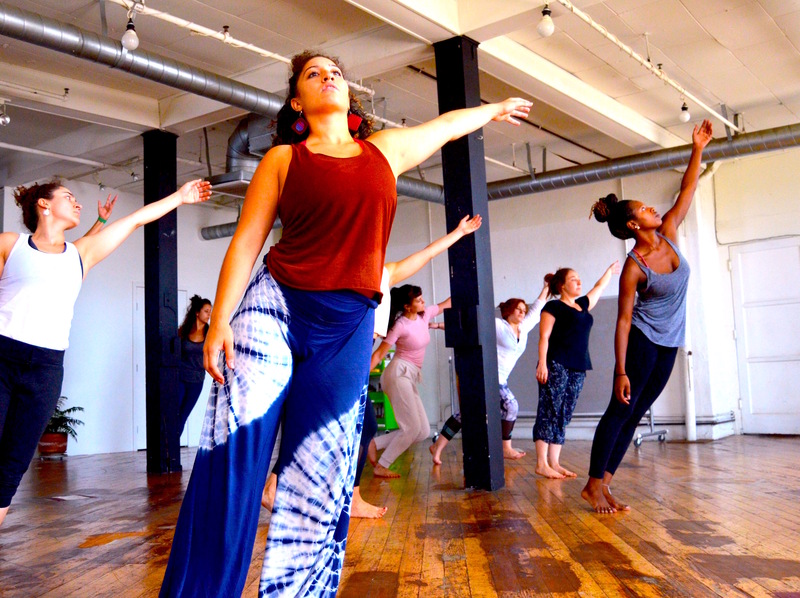 This dance class seeks to translate these ideas into the body — how can we embody principles of Afro-Latin dance practices while exploring our own unique expression? How can we embrace rigor and instinct, tradition and creativity, ancestry and individuality? Moving away from European-derived dance values (the linearity of classical ballet, the myth of the neutral body in post-modern dance), dancers are encouraged to cultivate an intimate relationship with the ground, a mobile spine and expressive pelvis, social improvisation, playful musicality and circularity in their bodies. Come ready to sweat and play. is a choreographer, dancer, and teaching artist from Brazil based in Los Angeles. Magalhães’s work lives at the intersection between healing and provoking, social and concert dance, personal and political narrative, and traditional and contemporary practices. She has shared her unique movement approach throughout the US, Brazil, Cuba, Botswana and South Africa, earning her an LA Weekly Theater Award for Best Choreography and critical acclaim from LA Dance Review, “the type of show that keeps concert dance relevant in our lives”, and Creative Feel Magazine, “riveting… a physical and emotional feat”. She is constantly crossing borders, in dance and life, and thus, builds bridges.